There are plenty of guides out there for humans about training their dogs - as if humans have ever been the ones in charge. 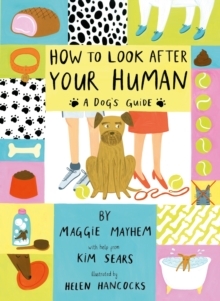 One dog has at last agreed to share the insights gained through years of hard experience: Maggie Mayhem has trained some of the world' s most stubborn humans (including her co-author Kim Sears), and so there is no better canine to explain the complexities of human behaviour and guide you through the ownership journey. HOW TO LOOK AFTER YOUR HUMAN will include:- - tips and techniques on everything from choosing the right human for you, to managing their diet and instilling a mutually beneficial exercise regime- - a guide to deciphering human language, including which words you should be paying attention to (very few) and those you should ignore entirely (rather a lot)- - advice on the vexed issues of fancy dress (canine) and personal hygiene (human)Written with Maggie' s signature wit and wisdom, HOW TO LOOK AFTER YOUR HUMAN is a perfect gift for dogs looking to build that unique bond with their humans. The text is accompanied throughout by bright, quirky artwork from critically acclaimed PENGUIN IN PERIL creator Helen Hancocks.